“Everything they did at Vienna was geared to get me back on my feet as quickly and easily as possible. Note: Following hip replacement surgery, John completed one month each as an inpatient and outpatient at Vienna. He was one of the first outpatients at Vienna’s new rehab facility in December 2011. “They’re kind and gentle, and very positive. But they’re also aggressive in their desire to see you improve. When you have someone truly interested in your recovery, it makes you want to work even harder,” Pat says. Pat doesn’t stay still for long. She was anxious to return to her duties with the Lodi Police Department’s Partners Program, where she’s a trained volunteer who’s been honored for her service in recruitment and patrolling city streets, parks and schools to make Lodi a safer place. 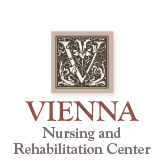 "This was my second time at Vienna, and I would never go anywhere else for rehab. The therapists are so kind and thoughtful. The staff makes you feel safe and welcomed all the time, and I have my dignity when I’m here. The food is good as well. I love it at Vienna. I'm excited that I can come for out-patient therapy once I leave." “When I arrived at Vienna I was very sick, and could not walk because I wasn’t able to bend my knees. But with rehabilitation exercises and wonderful therapists who did everything in their power to help me, I’ve been able to stand and use a walker. Now I’m working with Kristi and Al (therapists) on using a cane to walk.